In a time when so many of the old community theatre companies have disappeared, Whittier’s is remarkable, having opened the second of four shows constituting its 97th straight season. The new production, Craig Lucas’ “Prelude to a Kiss,” is hardly your typical community theater show, but then Whittier has been doing a lot of bending that image lately. The tale follows the whirlwind romance of Peter and the often pessimistic Rita up to a wedding which, thanks to the appearance of an unknown elderly man, sets their story on an odd trajectory. Is Rita still Rita, or has there been some kind of exchange between Rita and the unknown man? If so, now what? Jason Cook is Peter, the boy in this boy-meets-girl fairy story. As such he becomes both protagonist and narrator, and is largely responsible for not only the tone but the tempo of the piece. It takes him a bit of time to warm to this, but once in full swing, he proves as nonplussed and yet desperately hopeful as one could wish. As Rita, Jessica Taylor Gable makes a good foil for Peter’s casual optimism, and switches gears well as the tale becomes more convoluted. In the second half, as more is revealed and things get weirder, both hit their stride in ways which propel the story and capture the audience’s focus. Also worthy of note are Jose Barajas as Peter’s longtime and rather bland friend, and Nancy Tyler, particularly when playing the elderly man’s concerned daughter. Loriston Scott has some solid moments as a bartender, and Kathryn Hunter and Gary Page make real characters out of Rita’s quirky parents. Still, it is as that elderly man that Lewis Crouse often nearly steals the show. He manages to balance the weird internal struggles of this dual person, while connecting with the two principals in very interesting ways. Director Roxie Lee has a sense of what can make this production work and has created real connection between the characters. It all works, with one major exception. In also designing what set there is – mostly furniture which can be moved quickly on and offstage, she has neglected the fact that the stage of The Center Theatre, where they perform, is really quite large. The space defeats the innate intimacy of this piece. Narrowing the entire area would do the show great service, and perk up the first half which is broken too much by the episodic pauses for furniture shuffling. Still, especially in the second half, “Prelude to a Kiss” proves amusing with an undercurrent of great heart. One word of warning, though. Unlike most community theater fare it has references to sexual fantasies and intimacy which may make it unsuitable for younger children, and those who would be offended by such elements. Still, it’s worth taking a look, and celebrating a theater which may easily be the longest-running company in Southern California. The Whittier Community Theatre, now in the midst of its 94th consecutive season, has admittedly had its ups and downs, but when they do something right, they really do it right. Take as prime example their current production of Albert Hackett and Frances Goodrich’s adaptation of “The Diary of Anne Frank.” This deeply touching and absolutely true story of Jewish families hiding from the Nazis in a Dutch attic, as described to her diary by the teenaged Anne, cannot help but be affecting. Now, between casting, pacing and even the set design, WTC has brought the tale to life with an appropriate, clean vividness. As we, this year, mark the 70th anniversary of the defeat of Hitler, the show proves both instructional and endearing. The tale is part of the modern psyche. After the liberation of western Europe Anne’s father returned to the attic where he, his family and several others had hidden for three years. Among the things left behind was the diary he had given his younger daughter, Anne, as they entered that attic. An aspiring writer, she dedicated long hours to describing their time there, philosophizing about the human race, and dreaming of a time beyond their self-imposed captivity. Director Lenore Stjerne has gathered a cast of performers who not only embody the characters in that attic with skill, but look the parts as well. Richard De Vicariis, in perhaps his best role, plays Anne’s father Otto, the group’s central organizer and a man intent on keeping his humanity in the midst of claustrophobic human strife. Patty Rangel is Anne’s mother Edith, domestic and practical and desperately trying to maintain a sense of community. James J. Cox is the somewhat questionable, bitter friend Otto feels he must pay back by bringing to the attic, while Joan Meissenburg makes interesting work of his materialistic, desperate wife. Tim Heaton gives the hermit-like last-minute addition to the group a petulant angst which helps define the tensions of this captive group. Casey Morlet makes a sympathetic Miep, the young woman who continued to supply the group with basic necessities throughout their isolation. John Francis makes Otto’s employee, and Miep’s partner in secrecy, a fragile but dedicated man. Fitted in with this are the three young people, who define the specific conflicts of energy, desperation and hope. Wesley Mathews makes the shy, introverted Peter into a careful but deep thinker. Brenna Hanlen gives Anne’s older sister Margot a calm fatalism which provides interesting counter-balance to Anne’s optimism. And, as Anne – narrator of her own story and rich optimist about human nature – Gracie Lacey leads the cast in every possible way. Thanks to Suzanne Frederickson’s set design, which utilizes the large Whittier stage while still giving a sense of the limited attic space, Stjerne can keep the flow going in such a way that one remains enraptured with the story. This is good, because the play is a long one – the first act an hour and a half – but the general quality means you don’t notice the passage of time. The costumes, created and coordinated by Karen Jacobson, accurately reflect time and place. Indeed, this whole production shows an extraordinary attention to detail, and a respect for the content which makes it a success. In short, this “The Diary of Anne Frank” is most certainly worth seeing. I would also recommend it for young people who may not have been exposed to the book. Personally, my grandmother gave me a copy when I turned 10, with an introduction by Eleanor Roosevelt. This is powerful stuff, and as we reach a stage of history where almost all those who survived the horrors of the Holocaust have passed away, it behooves us to take the time to remind ourselves what they went through. Perhaps such remembrances can mean that one day we will reach a world where genocide itself is a thing of the past. Anne Frank seemed to think we might. Farce is an art form all its own. It demands a particular kind of rhythm, both from the performers and from the playwright. Ken Ludwig may be the best known farce-writer in America. His “Lend Me a Tenor” has become the gold standard of this kind of airy fluff. Now, at the Whittier Community Theatre, another of Ludwig’s silly pieces, The Fox on the Fairway,” offers up laughter, pratfalls and comic mayhem once again. And once again, timing is everything. Fortunately, at WTC, the cast is – for the most part – up to the challenge. The play may not be quite as hysterical as “Tenor,” but it offers up plenty of laughs, snickers and a whole lot of golf humor. If you’ve got a golfer in the house, and want a laugh, this may be for you. The plot – such as it is – is fairly simple. It is the day of the annual grudge-match golf tournament between Quail Valley Country Club and their arch-nemesis, Crouching Squirrel Golf and Racquet Club. Quail Valley manager Henry Bingham is sure he finally (after five years of losing) makes an unwise bet with his rival’s manager, only to find that his best player has defected to the other club. He thinks he is saved when he discovers that his new assistant, Justin, is an extraordinary golfer. The problem is Justin only plays well when not upset, something which may prove trickier than Henry thought. Director John Francis has assembled a fine cast for this affair. Justin Patrick Murphy does everything but chew the scenery as the easily rattled Justin. MacKenzie Rae Campbell creates a delightfully volatile airhead as Justin’s fiance – the major cause of his upset. 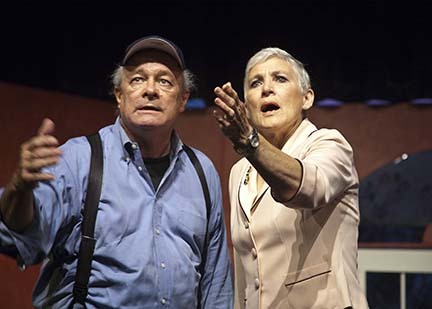 Lewis Crouse powers the piece as Henry – part bully, and part panicked investor. Greg Stokes, as the scheming head of the other club, really is as obnoxious and snotty as the character has to be. Roxie Lee, as a club board member, and Toni Beckman as Bingham’s domineering wife, both have wonderful moments. However they both need to work on projection. Some of their funniest lines are quite hard to hear. Vincent Rodriguez – a young man for whom this show is a high school senior project – makes a fine tournament announcer, having also helped bring this production into being. A nod must also go to Suzanne Frederickson for coming up with the perfect set for this kind of show, even if one of the swinging doors came loose due to all the slamming back and forth. Karen Jacobson must have had a ball with the costuming: finding all the truly obnoxious golf sweaters for Stokes’ character. Indeed, there is a real sense of polish to this essentially amateur production. The sound effects are just right. The costuming is pretty much right. The set is created with farce in mind. The characters are well defined, and create the kind of ensemble which makes this particular kind of ridiculousness work. As with all of Ludwig’s plays, the humor builds: the crazy really comes out in the second half, so wait for it. Try to catch this while you can. 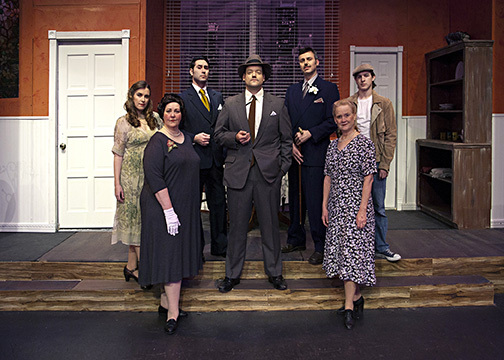 Sadly, WTC productions only last a couple of weekends – a part of their 92-year tradition.